Aida Cuevas, treasured as the “Queen of Ranchera Music” is bringing her classic, re-defined Mariachi stylings to State Theatre New Jersey on October 30! A successor of a long, rich history of Mariachi and Ranchera music, Cuevas has made groundbreaking strides as the first woman artist in her genre to win a Grammy®. In paying homage to classic Mariachi tunes such as “El Pastor” and her tribute to Juan Gabriel’s “Te Lo Pido Por Favor,” “Te Sigo Amando,” and “La Diferencia,” she has successfully dazzled crowds on international stages and in front of world leaders alike, impacting the genre globally as an empowered musician and woman. The history of Mariachi begins with a linguistic understanding of its origins dating back as far as 1519 to a word used by the indigenous Coca People of the region which is presently referred to as the free state of Nayarit. The most agreed upon theory of the word “Mariachi’s” origins derive from the Pilla or Cirimo tree from which its wood was used to produce the stage on which artists performed; this material which was was also used to make the guitars themselves. Music created during this time period has served as the fundamental sound for what has evolved into Mariachi and Ranchera music today. What is more closely related to Mariachi in today’s context originates from the sound known as “Son,” which is a mixture of Spanish, indigenous Mexican, and African traditions and differs depending on the region, but primarily originates in the present-day Jalisco region. Following a history of colonization and the enslavement of both indigenous people as well as people captured and transported through the slave trade to present-day Mexico throughout the 19th century, Mariachi music has evolved through these events as revolutionary action—and in its evolution of sound covers themes of love, betrayal, death, politics, and revolutionary heroes. The typical instruments in a Mariachi band consist of at least two violins, two trumpets, one Spanish guitar, one vihuela, and one guitarrón; some of these instruments which were introduced by Spanish colonization. However, in any given performance, a Mariachi band can feature more than 20 musicians. A unique sound is born out of the struggles and passions of a people building a platform for their own voice upon the Pilla and Cirimo stages of their ancestors through the vitality of music. Cuevas’ sound and style is also derivative of Ranchera music. Another genre heavily influenced by a history of people’s movements, Ranchera’s origins more specifically spawned out of The Mexican Revolution. Although Ranchera predates the revolution and is closely related to Mariachi, the genre grew to represent national patriotism in reaction to the imbalances created among rural and urban class structures. The word “Ranchera” originates from the spanish word “rancho” meaning ranch due to the music's countryside origins. As the end of The Mexican Revolution brought new jobs into major cities, so did the people from rural areas bring their music into these cities, thus creating a unified sound strong with poetic, passionate themes of love often moving its listeners to tears. Ranchera is defined as a symbol of Mexican nationalism through a revolution which sought to honor its roots in rural traditions. As is the case within the music industry regarding gender discrimination across all cultures and nations, historically there exists a theme of “machismo” within the genre of Mariachi and Ranchera; this term which refers to masculine pride. Despite these barriers, women within the genre have continued to express their agency by creating and playing their own music. Possibly one of Cuevas’ first predecessors, the first documented woman to play in a mariachi band, Rosa Quirino, emerged in 1903. She played alongside men, making herstory, meeting ridicule with talent. Following her footsteps are artists such as Las Adelitas, Las Estrellas de Mexico, and Mariachi Arcoiris de Los Ángele—the first openly LGBTQ Mariachi band—and so many more who have served as pioneers in Mariachi herstory. Cuevas’—whose career began in 1975 at only 11 years old—own contribution as the first woman in Mariachi to win a Grammy Award® has been outspoken about her involvement within the movement through her art, fashion, and even around the #MeToo and #TimesUp conversations. 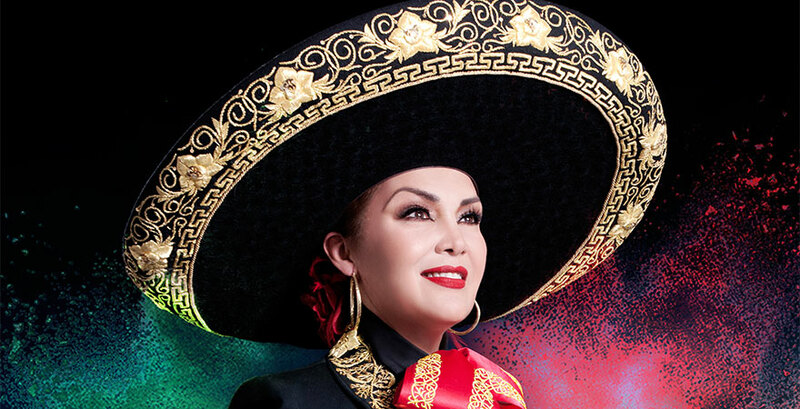 Cuevas speaks about her great sense of pride in her Mexican roots, donning the traditional “charro” in her performances; these uniforms which are typically associated with cowboys and male musicians. Her multiple gold and platinum records prove that talent and passion know no limits within the barriers which humans create in the most universal forms of expression such as music and the arts. She surely serves as an example and trailblazer for all women hoping to fearlessly exude their passion in the arts. If Mariachi and Ranchera are both defined by the storytelling and revolution of a people, then Aida Cuevas exemplifies these themes thoroughly. Join State Theatre New Jersey in honoring and celebrating the passion and art of Aida Cuevas’ Mariachi and Ranchera as she pays tribute to the music of Juan Gabriel on Tuesday, October 30, 2018 at 8pm. 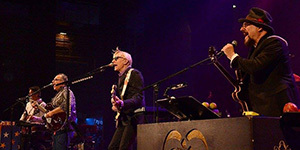 Hot 2018 Concerts at The State!